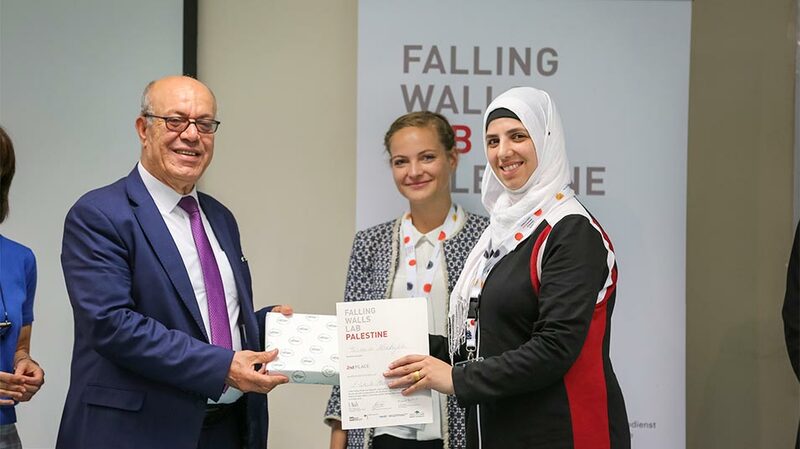 “Creating and catalyzing a culture of innovation – entrepreneurship and intrapreneurship - is one of the top priorities for Birzeit University as it tries to keep pace with the ever-changing needs of society and economy,” said Vice President of Planning and Development Dr. Mirvat Bulbul at the second Falling Walls Lab Palestine, held on Tuesday, May 8, 2018, at Birzeit University. Falling Walls Lab Palestine, organized by the German Academic Exchange Service (DAAD) together with the Innovation and Entrepreneurship Unit (IEU) at Birzeit University, supported by the Higher Council of Innovation and Excellence, and funded by the Federal Foreign Office of Germany, is a vibrant innovation incubator that aims to promote exceptional ideas and connect promising scientists and entrepreneurs from all fields, locally and globally. Participants have the opportunity to present their research or breakthrough ideas – in three-minute slots – to a high-caliber jury made up of experts from academia, business, and the general public. Established in 2009 on the 20th anniversary of the fall of the Berlin Wall, the Falling Walls lab serves to break down the walls that inhibit progress, advancement, and unity by promoting innovation across the globe. 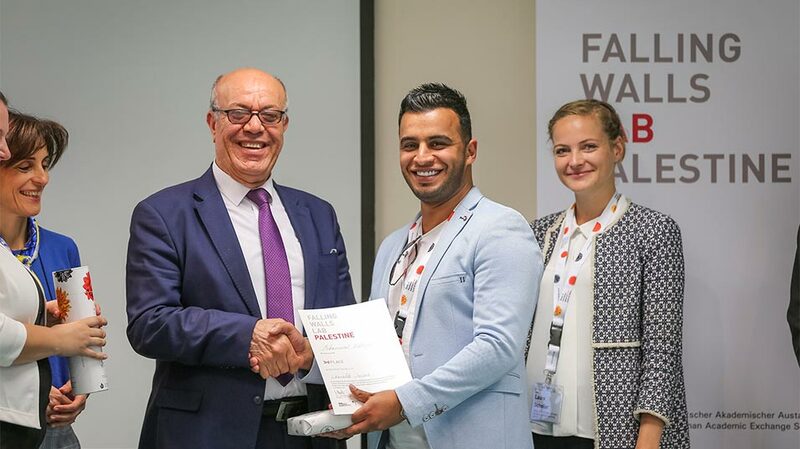 Each year, academic institutions are invited to host their own Falling Walls Lab and to showcase the quality, diversity, and passion of their region's most innovative minds. 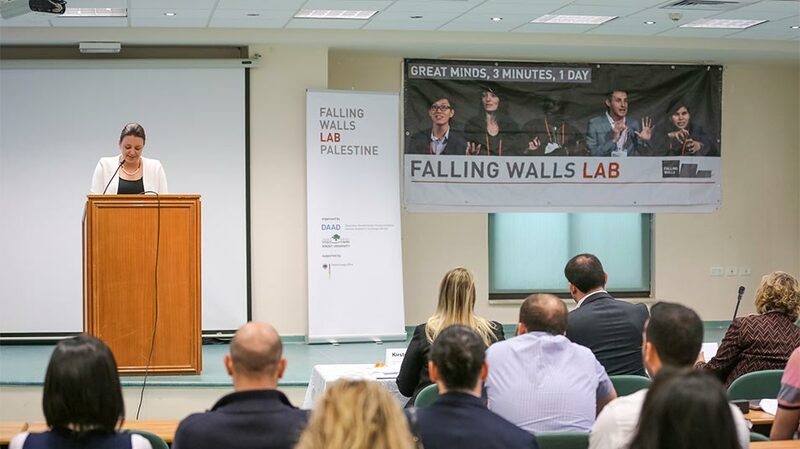 The most intriguing presenters of the locally-hosted Falling Walls Labs travel to the Lab Finale in Berlin, Germany on November 8. 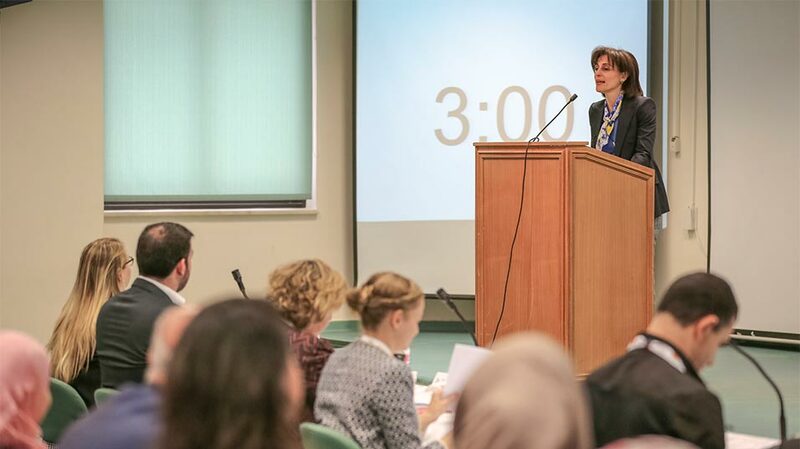 Christina Stahlbock, director of the DAAD Information Center in East Jerusalem, in her opening remarks, emphasized the importance of breaking psychological walls, which linger for much longer than the physical ones. “By now, the Berlin Wall has been gone longer than it existed but is still much having a mark on German society. A proof that not only the walls we can touch, but also the ones we might have in our heads, can hold us back,” Stahlbock said. 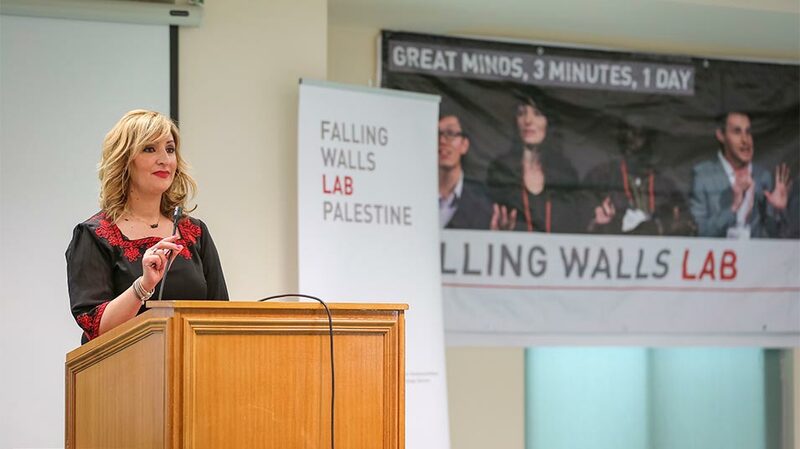 In her speech, Dr. Bulbul noted that Palestinians would especially be pleased at the notion of “Falling Walls,” considering the constricted access to resources and restrictions on mobility that are hindering their chances at innovation. “We look forward to breaking down the walls of restricted mobility, of lack of opportunities, of traditional learning. We’re working to bring down our own walls and set forth on a new era of innovation and entrepreneurship,” remarked Bulbul. Laura-Louisa Scheller, the first secretary of Cultural and Protocol Affairs at the Representative Office of the Federal Republic of Germany to Ramallah, highlighted the representative office’s continuing support to innovators, tinkerers, and thinkers. 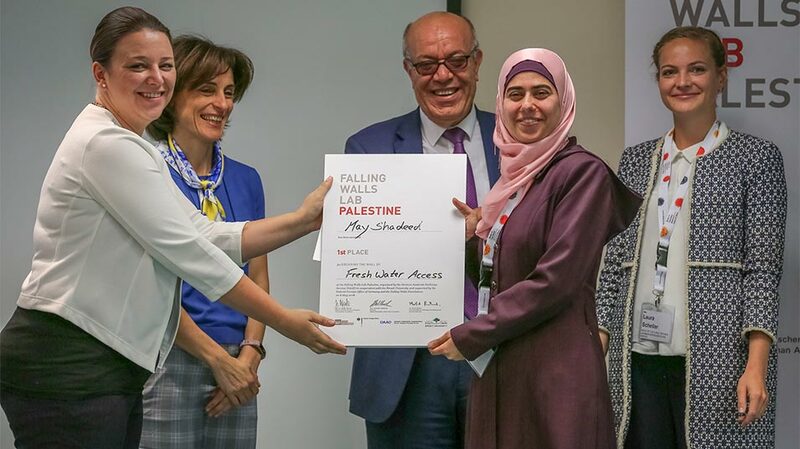 Despite the difficult circumstances, she added, the ever-growing relationship between Germany and Palestine, and the constant exchange of expertise and ideas, can bolster innovation in all fields and disciplines. 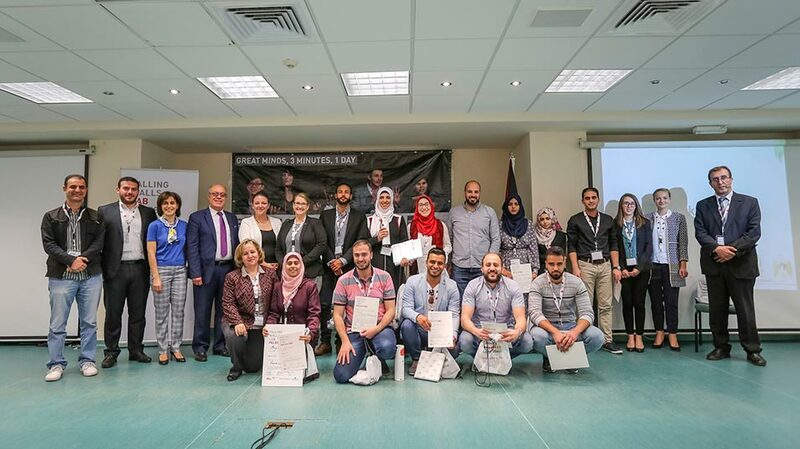 Eleven participants, from various majors, disciplines, and areas, presented their pitch decks on how to solve pressing problems in the context of the Palestinian society during the event. The participants were: Ali Tazami, whose presentation revolved around health and fitness; Maysan Nashashibi, who explored ways to reduce water pollution; Derrar Ghanem, who delved into changing the status quo by utilizing social change; Safaa Humaidat, who discussed aerodynamic computational fluid dynamics analysis; Mohammad Kabajah, who highlighted wearable insule; Mays Shadeed, who discussed fresh water access; Samer Wannan, who analyzed standard architectural walls; Nour Nassar, who investigated ways to minimize power blackouts; Tasneem Abuhijleh, who examined e-waste management in Palestine; Osaid Nablusi, who reviewed the power of music; and Suhaib Nazal, whose presentation probed artificial intelligence in autonomous driving and self-driving cars. Appraising such an excellent array of presentations was a group of seven esteemed panelists: Laura Scheller; Kirsten Freimann, from the German Corporation for International Cooperation (GIZ); Dr. Hussein Shanak, a DAAD alumnus who currently teaches at the Palestine Technical University – Khadoori; Dr. Sameh Abu Awwad, chair of the Department of Mechanical and Mechatronics Engineering at Birzeit University; Sarah Kuhail, acting executive director of Al Nayzak; Dr. Safaa Nasser Al Deen, head of the Stimulation and Incubation Committee at the Palestinian Higher Council for Innovation and Excellence; and Jamil Isayyed, head of software development at AXSOS, AG.